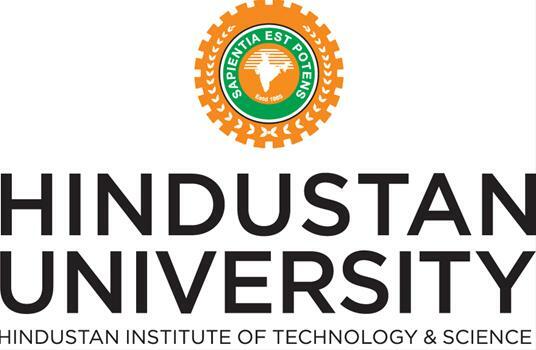 Hindustan University, established in the year 1985, has been conferred the “University Status” by UGC, Government of India Under Section 3 of UGC Act 1956 with the name “HINDUSTAN INSTITUTE OF TECHNOLOGY & SCIENCE” from the academic year 2008 – 09. Admissions open for 2016.The University is accredited by the National Assessment and Accreditation Council (NAAC), which is the Statutory Body for accreditation of educational institutions in India and is an Autonomous Institution of the University Grants Commission (UGC), Government of India. National Board of Accreditation, New Delhi (All India Council for Technical Education) Hindustan University – ample opportunities are provided for research minded students to hone their research skills. The purpose of the research is to ask questions and solve problems. This institution has an exceptional resource, with unique capabilities. The knowledge that is generated in our University is being applied to real-world problems every day. By combining cutting-edge research with graduate and undergraduate education, our research university is also training the next generation of leaders. The research scholars participate actively in pioneering research studies through Ph. D., M. S. (by research) and M. Phil. programmes. The faculty of Engineering, Science, Humanities and Management conduct research do active research in emerging areas, which often results in highly acclaimed publications in International and National journals and patents. Most of the research work is also presented in International and National Conferences. The Department of Science & Technology, Aeronautical Research & Development Board, Indian Space Research Organisation, Ministry of Non-Conventional Energy Resources and Defence Research & Development Organisation, Naval Research Board, Department of Electronics, IGCAR, Atomic energy agencies and other organizations support the institution either giving funds for research projects or providing technical support for tackling the challenging research issues of national interest. Our faculty also undertakes several application oriented industrial consultancy projects with industries in India and abroad and collaborative research projects with foreign universities. Opportunities are available for interested students to participate in such sponsored research, industrial consultancy or collaborative research projects. The Engineering, Science, Humanities and Management Departments of our Institute are equipped with excellent laboratories, facilities with state-of-the-art equipment. Research works are carried out in the interdisciplinary areas among the Departments which may be pursued by the research scholars for the Ph. D. degree. B.C.A: B.C.A, General Multimedia and Animation, Database System. P.G Programmes: Aeronautical Engineering (M.Tech), Automobile Engineering (M.Tech), Avionics (M.Tech), Structural Engineering (M.Tech), Thermal Engineering (M.Tech), Internal Combustion Engineering (M.Tech), Engineering Design (M.Tech), Refrigeration and Air-Conditioning (M.Tech), Computer Aided Design (M.Tech), VLSI Design & Embedded Systems (M.Tech), Communication System (M.Tech), Aircraft Maintenance Engineering (M.Tech), Software Engineering (M.Tech), Computer Science and Engineering (M.Tech), Power Electronics and Drives (M.Tech), Applied Electronics (M.Tech), Embedded Control(M.Tech), Power System Engineering(M.Tech), Process Control and Instrumentation Engineering (M.Tech), Industrial Automation (M.Tech), Robotics and Control (M.Tech). Facilities : Transportation, Library, Internet Banking/ATM Facilities, Cafeteria, Seminar Halls.